Justice League Heroes is role-playing action starring the world's greatest heroes! 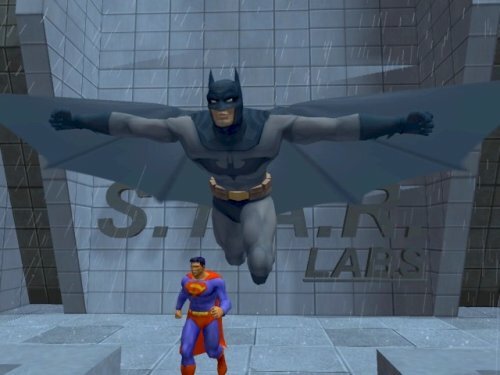 For the first time on current generation consoles, 1 or 2 players can play as Batman, Superman, Wonder Woman, The Flash, Green Lantern, Martian Manhunter, Zatanna and others -- The Justice League. They'll face a legion of notorious villains, as Brainiac and his cronies try to conquer the world and eliminate the Justice League forever. Using the extraordinary superpowers and amazing skills of Batman, Superman, Green Lantern, The Flash, Wonder Woman, and other favorite DC Comics super heroes, players must join the Justice League to ultimately save humanity from Brainiac and the dark forces that lurk in the universe. I really enjoyed this game. More importantly, my 4-year old LOVES it (a bit too much, probably). We have great fun playing it together and exploring the different super-powers available and great virtual locations in which the action takes place. Even my wife enjoys playing it occassionally. To the harsh critics of this game: Give it another chance, you may find it grows on you. Admittedly, it's not one of those games that provides any serious challenges (e.g., Half-Life 2) but it's still hours and hours of good bad-guy-smashing fun. Mind you, if you are not a fan of DC Comics, you may be at a disadvantage. If you are, though, you have one more reason to love this simple but entertaining game. Not as polished as Ultimate Alliance but still FUN! Justice League Heroes is an action RPG game in the same vein as Marvel Ultimate Alliance and X-Men Legends. You take control of heroes like Batman, Superman, Wonder Woman and Green Lantern to save the world from Brainiac, Grodd, and other DC villains. I had a lot of fun with this game, though it's not a perfect adventure. True to genre conventions, you roam around maps from an overhead perspective, beating up enemies and slowly leveling up your characters. Each character has 5 special powers you can use, from Zatanna's polymorph ability (turn enemies into rabbits!) to Wonder Woman's lasso and Superman's heat vision. Your mileage will vary with each character - Superman and Wonder Woman are the powerhouses (just like in the comics), and with some leveling up I found Batman to be pretty useful. I never got the hang of Flash, and Green Lantern felt more like a defensive character with his energy shields and cages. The game contains a 'Boost System' that lets you mix and match collected power-ups to create stronger ones to help augment your powers. It adds a bit of depth to what is otherwise a fairly straightforward setup. Early on you'll find you're fairly weak and resort to hit-and-run tactics against enemies. While this never really goes away (your health regenerates over time, so you'll be resting quite a bit), eventually you'll be able to take quite a bit of punishment and give back even more. This is when Justice League Heroes comes to life, and you really feel like you're Superman and Batman. The game is 2-players only, and half the time restricts you to specific characters each level to further the story (which is written by Justice League Unlimited producer Dwayne McDuffie and is quite good). This wouldn't be so bad except that you also get to unlock additional heroes like Green Arrow and Aquaman, and can use them in select missions. The problem comes in that if you choose to use the bonus heroes and neglect to level-up the original 7, you'll find yourself screwed later on when you're forced to play as Flash and Martian Manhunter again. It's a glaring flaw and takes away from the fun of unlocking and using more DC characters. Otherwise there's the usual AI issues, such as having your partner blunder into a fight and die rather than retreat when their health is low. And the gameplay itself can get a bit repetitive, but that's par for the genre.